Visit the Nature Centre's Upcoming Events page and Essex County Field Naturalists' Club Activities page for upcoming programs. Temperatures averaged 2 degrees C cooler than normal with precipitation about 25% above normal for the month. Tuesday, May 7: The large number of migrants seen yesterday in Ojibway Park continued to increase today. Birds seen on the grounds of the nature centre include White-crowned & White-throated Sparrows, Rose-breasted Grosbeak, Ring-necked Pheasant, Baltimore Oriole and many warblers such as Nashville, Cape May, Tennessee, Blackburnian and American Redstart. Friday, May 3: Oakwood Park (between South Windsor Arena and Oakwood Community Centre) was excellent for woodland migrants today. Some of the species seen included Wood Duck (pair), Cooper's Hawk (pair), Hermit Thrush 12, Least Flycatcher 2, Eastern Kingbird 1, Tufted Titmouse 1, Black-capped Chickadee 2, Carolina Wren 1, Ovenbird 1, Nashville Warbler 1, Black-throated Blue Warbler 1, Palm Warbler 5, Yellow-rumped Warbler 50, Kentucky Warbler 1 male, Black-and-White Warbler 1, Northern Waterthrush 2, Common Yellowthroat 1, Eastern Towhee 1 and White-throated Sparrow 50. Thursday, May 2: New spring migrants include an Ovenbird (today) and Louisiana Waterthrush (Tuesday, Apr 30). Typical migrants this week include Ruby-crowned Kinglets, House Wrens, Yellow-rumped Warblers, Eastern Towhees, and White-throated Sparrows. 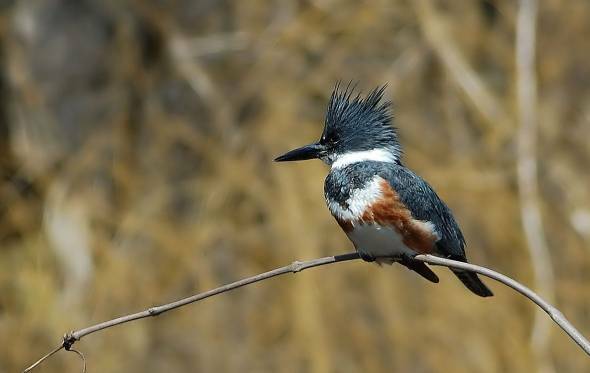 Belted Kingfishers have been noisy and conspicuous along the creek in front of the nature centre. Yellow trout lilies have finished flowering but other early species such as wood anemones, spring beauties, jack-in-the-pulpits and smooth yellow violets are still flowering. Native flowering shrubs include plums, juneberries and wild crabapples. Our first Red Admiral butterflies appeared on Tuesday, April 30. Three were seen along park trails along with a few Spring Azures and Cabbage butterflies. Copyright © 2002. All rights reserved. You are on the City of Windsor World Wide Web Site.